Are you looking for a fun way to present a special birthday gift? This fun interactive box has a special drawer where you can place your gift. When the recipient opens the drawer, out pops open a special little note card where you can hide a message. 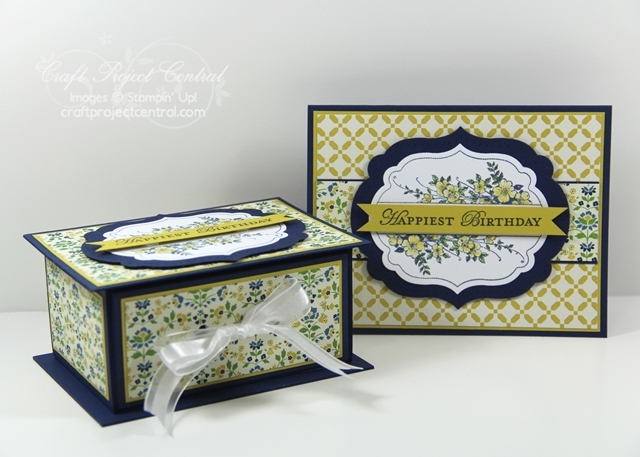 The fun gift box is sure to surprise whoever receives it and the matching birthday card is sure to impress. This project is also a fun class project! This tutorial was designed by me! And here is a short video showing you how this fun gift box is interactive! In the video I meant to say May edition of Craft Project Central. For some reason my brain has been on June. To get this fun tutorial just subscribe to the May edition and then meet one of the bonus project requirements of subscribing to two or more months in a row, putting the Craft Project Central badge on your blog, or referring a friend and when they subscribe, letting CPC know!